Homeowners often tell us that one of the elements in designing a new kitchen that is the trickiest for them is selecting ventilation. There are many kinds of ventilation to consider and, in this post, we'll be looking at the most popular, overhead ventilation. Overhead Ventilation...why do we need it? There are four by-products that are created when we cook: heat, grease, steam & smoke. The purpose of your ventilation is to remove these by-products from your kitchen so they are not deposited on your ceiling, walls, cabinets, fabrics, etc. There are four basic factors in selecting the right overhead ventilation for your project. First, you want to choose the canopy size and design that will hold the contaminants prior to removal (also known as the “capture” area.) The size and design of the canopy will depend on your cooking equipment. For example, if you have selected a 48" Wolf Gas or Dual-Fuel Range, you might consider the Best WP29M484 model, with their new IQ internal blower system. IQ actually stands for "intelligent and quiet," making for a system that is two times quieter and provides 30% faster smoke removal than a standard blower. This Best hood has the proper capture area to effectively cover the cooking surface of the 48" range (which is 48" wide x 18" tall x 24" deep) and it uses a 1200 CFM Best IQ internal motor. This is not the only choice you have, but it is an excellent one and when you come to Clarke, we will discuss the various options so that you may select the one that fits your aesthetic and budget. Second, you want to choose a blower that is capable of removing pollutants. This is done through what's known as "CFM" or the unit's cubic-foot-per-minute rating. A popular formula used for calculating the correct CFM for your cooking equipment is to total up the number of BTUs (include burners, griddle, grill and oven) & divide by 100. (For those keen on the meaning of acronyms, BTU stands for British Thermal Unit, however it is now used universally as a measurement of energy. One BTU is equal to the amount of energy used to raise the temperature of one pound of water one degree Fahrenheit.) This formula will give you a good sense of the CFM required for the cooking equipment that you have chosen. However, the CFM can vary depending on the length of your duct run and how many elbows are along your duct run. The correct placement of your blower is also important. There are three placement options for your blower: Internal, Inline and Remote. An internal blower is installed within the canopy, an inline blower is installed typically in an attic or somewhere along the duct run, and a remote blower is installed either on an outside wall or a roof. The placement of the blower will depend on where your cooking equipment is being installed in the kitchen, how long the duct run is and access or structural limitations. Your third task is to choose a filter that will contain grease produced from cooking. Baffle filters are a good choice for grilling or frying and work best when operating at a higher speed. Mesh filters work well regardless of the speed, allowing effective, quiet operation. New mesh-lined Hi-flow filters by BEST combine baffle & mesh features for the “best” of both worlds. Mounting height is key. Depending on the style of your hood, it should be mounted somewhere between 27" and 36" off the cooking surface. The installer must make sure they use the required duct size for the motor you have selected. The key is to run your duct up and out as directly as possible! The more turns you make and the longer your duct run is, the less efficient your ventilation will be. So it is very important to minimize the length of the duct run and the number of elbows used. There are many different options in cooking ventilation and in future posts we will cover downdraft ventilation, as well as exciting new decorative options that make ventilation a piece of art in your kitchen. However, it's always essential to see ventilation as one of the keys to making your kitchen operate well. Without the right unit, you will not enjoy clean air, and you might find yourself in a very noisy room that is not at all what you planned. Clarke is always here to help homeowners, designers and installers ensure that ventilation is specified and installed properly. 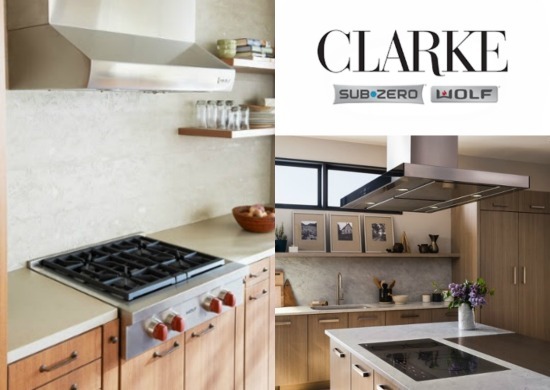 Please visit Clarke, New England's Official Sub-Zero & Wolf Showroom and Test Kitchen, to see the latest in ventilation and meet with one of our knowledgeable consultants to understand more about how to select the right unit for the cooking equipment you are purchasing.